Venus Williams is 38 years-old. The American professional tennis player weighs 72.5 kg (160 pounds) and has a height of 6’1” (185 cm). Her workout includes cycling, elliptical, Pilates, and dancing which helps her maintain a 35-26-35 figure. 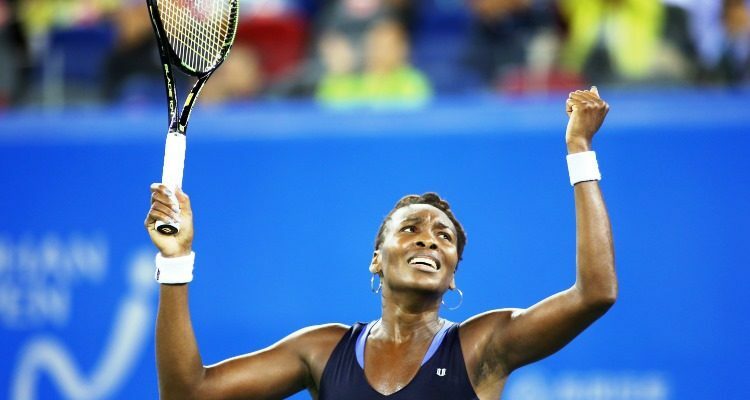 Venus William’s fitness level suffered a major drop after the detection of Sjogren’s syndrome. Though she has fought it back and went to the finals of Australia Open 2017 but lost to her sister. She has adopted plant-based diet to fight this condition & for overall fitness. Best known for: Being the former top female tennis player in the world. She achieved the #1 ranking on June 7, 2010. Many people don’t know that Venus Williams suffers from Sjogren’s syndrome, and most people don’t know much about the disorder to begin with. What is Sjogren’s syndrome, and why would it have an effect on Williams’ tennis abilities? Sjogren’s syndrome is an immune system disorder that primarily affects the eyes and mouth. With Sjogren’s syndrome, the immune system’s cells begin to attack tear and saliva glands, as well as mucus-secreting membranes. This causes dry eyes and a dry mouth, which are the most common symptom associated with the disease. Sjogren’s syndrome affects roughly four million people in the U.S. While the disease is not considered very common, it is notoriously difficult to diagnose. Since the conditions vary and are nonspecific, many sufferers can have a hard time receiving the right diagnosis. Indeed, by looking at Venus Williams, anyone would conclude that she looks very healthy. To help cope with her symptoms, she’s adopted a raw vegan and plant-based diet, which contains lots of anti-inflammatory foods. Venus Williams calls herself a “cheagan,” which is a portmanteau of the words vegan and cheating. It’s a vegan-based diet that allows for some deviation. Vegans can technically eat processed foods such as French fries and potato chips (as long as there are no animal products in them), but healthier vegans tend to choose only nutrient-dense plant-based foods, especially various green vegetables. Williams says she’s not perfect but follows a plant-based diet and lifestyle, with the occasional indulgence. She regularly enjoys fresh vegetable juices, including wheatgrass shots. Wheatgrass is a nutritional powerhouse that helps treat skin diseases, cancer, digestive conditions, blood disorders, atherosclerosis, and inflammatory conditions. Plus it can help control weight loss and food cravings, and cleanse the liver of heavy metals and other toxins. Venus Williams eats a raw vegan diet to help treat Sjogren’s syndrome; however, a plant-based diet is also thought to decrease the risk of other diseases such as heart disease, diabetes, and cancer.